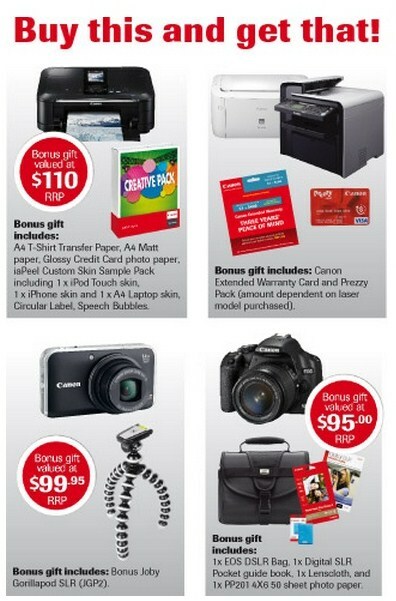 Canon Business Gifts Promo in NZ. Here’s a cool promo from Canon in New Zealand. Head in-store to purchase, then register your purchase online to redeem your BONUS gift and let Canon help you grow your business. The caption indicates a classic Gift with Purchase – Buy this and get that! The promotion is tiered meaning that you can earn different products to go along with different products Canon can supply. Custom DSLR Bag, book, Lens Cleaning Cloth etc..
PIXMA Start discovering the creative possibilities available to you with our latest PIXMA range. For everything you need to get started get your BONUS Creative Pack today. Laser – Equip your business with a high performance Canon Laser printer and experience the difference it can make. EOS Canon’s EOS Digital SLR Cameras allow you to capture your imagination and demonstrate your own endless creativity. Become a part of the World of EOS and you’ll find yourself taking better photos in no time.